At times I wondered if Roth was practicing what has sometimes been called the fallacy of imitative form--in this case, writing a slightly incoherent book to reflect the incoherence of his aging hero's mind. At other times, I concluded that his lack of a strong plot, the weak fantasy playlet of "He and She," the attack on the modern tendency to reduce art to a complex or an ism, and the many pages, albeit excellent in themselves, about George Plimpton were all typical of "late style," that wild freedom characteristic of great artists in old age when they blithely ignore the expected conventions and disdain the polish of ordinary form and beauty. Toward the end of life, mere "art" seems to get in the way of truth. Exit Ghost has been widely touted as the last stand of Nathan Zuckerman. Here, we've been told, is the farewell appearance of Philip Roth's sturdiest alter ego, who has kibbitzed his way through eight previous novels and even poked his nose into the author's single work of autobiography. About time, I thought. In his earliest incarnations, Zuckerman was a brilliant ploy--a fictional proxy who talked like Roth, walked like Roth, and could easily be mistaken for the man himself. In truth he was more like a stunt double, who resembled his creator but absorbed a much more outlandish level of punishment. Yet Roth thrived on this ambiguity. Self-exposure, self-invention--these were the twin poles of his imagination, generating their wild, comic, lacerating currents. Roth needed his mouthpiece, his trash-talking semblable. As he told an interviewer in 1983, fiction was above all a transformation "of a personal emergency into a public act." After introducing Zuckerman as a full-fledged character in The Ghost Writer (1979), Roth kept up this pas de deux for three increasingly antic, self-centered novels. Then he raised the stakes in The Counterlife (1987), where both Zuckerman and his kid brother Henry were parachuted into zany inversions of their native Newark: Israel (where a Jew was the paradoxical norm) and England (where a Jew still scrabbled to climb the sociological ladder he had long since ascended in the New World). Surely this would be the final, flagrant shuffling of identities. Wasn't it time to demobilize this wandering Jew? It was not. Just a year later, he was marshaled for a nervy, tailgunning afterword to The Facts: A Novelist's Autobiography--a smart move on Roth's part. But after that, Zuckerman fell on hard times. In the ambitious trilogy of novels beginning with American Pastoral (1997), he remained on the sidelines, providing color commentary. For this reader, he seemed like a superfluous presence--a way for Roth to dodge direct engagement with narratives that were already recycling his most cherished motif, the extrication of the individual from the stultifying straitjacket of communal life. Zuckerman was Zelig with a typewriter, a tape recorder, a megaphone. In these novels, with their alternation of mind-blowing magnificence and irritating echolalia, Zuckerman was precisely what he once accused Roth of being: a crutch. For all of these reasons, Zuckerman deserves to go out with his head held high. And Exit Ghost, at least in its initial pages, promises a kind of victory lap. Zuckerman, you see, is contemplating a return to the madding crowd. He has spent years on his New England hilltop, with a monastic focus on his prose and an increasingly tenuous connection to the great world. "I'd conquered the solitary's way of life," he tells us. "I knew its tests and satisfactions and over time had shaped the scope of my needs to its limitations.... Why invite the unanticipated, why court any more shocks and surprises than those that aging would be sure to deliver without my prompting?" Why indeed? What first tempts this monk down from his mountain is a minor urological procedure, which may absolve the incontinent Zuckerman from wearing a grown-up diaper. Control over his bladder, he ventures, could go some distance toward reuniting him with the rest of the human race: "I who'd never thought along these lines before, who from the age of 12 was bent on singularity and welcomed whatever was unusual in me--I could now be like everyone else." Zuckerman being Zuckerman, he immediately reminds himself that shame and concealment are what bind us together in the first place--it's the prospect of a wet diaper that prompts the real shock of recognition. Nonetheless, his return to New York City in the fall of 2004 represents a terrific temptation. Wandering the streets after a decade-long absence like a Semitic Rip Van Winkle, he is both tantalized and tortured by the prospect of reconnecting. Roth being Roth, he finds the perfect metaphor for his character's ambivalence: the cell phone. Having avoided this innovation in his rural fastness, Zuckerman is mostly appalled by the gabbling conversationalists on every street corner. "To eradicate the experience of separation must inevitably have a dramatic effect," he ponders. How shocking, and tragic, that "the immense loneliness of human beings should produce this boundless longing to be heard--and the accompanying disregard for being overheard." It's deliciously ironic that Zuckerman, who proved his mettle as an eavesdropper way back in The Ghost Writer, should be filing a brief on behalf of privacy. But there's a sadder irony afoot as well: the experience of separation is exactly what's been killing him for the past decade. At this point, perhaps, Zuckerman would have fled back to the sticks, where even Verizon fears to tread. But two more developments conspire to keep him in Manhattan. First, he encounters Amy Bellette, whose youthful resemblance to Anne Frank in The Ghost Writer cued some of the most blasphemous fantasies of his career. She is now deathly ill, her brain half eaten away by a tumor. She is also defending her late husband, E.I. Lonoff, from a scandal-mongering biographer. And since Zuckerman is seldom monogamous by nature, there is a second woman: Jamie Logan, a young married writer who rings his bell the moment she walks through the door. He can hardly resist touching her. He can hardly hold back "whatever words a man as mutilated as I was says to a desirable woman 40 years his junior that will not leave him covered in shame because he is overcome by temptation for a delight he cannot enjoy and a pleasure that is dead." The ingredients are all there: love and death, art and resurrection. And then, about halfway through this midsize novel, the wheels come off. The first danger sign occurs when Zuckerman, after each encounter with the alluring Jamie, scuttles back to his hotel room and writes an imaginary dialogue between the two of them. The speed with which fiction supplants reality is no surprise--two decades ago, Zuckerman was already doubting whether "the truly shaming facts can ever be fully borne, let alone perceived, without the panacea of the imagination." Still, there's something infantile about this retreat into stage-managed fantasy, where the object of Zuckerman's affection laughs at all his witticisms. And it's not clear whether the joke is ultimately on Zuckerman or Roth himself, who handled much of this same material with considerably less bathos in The Dying Animal (2001) and last year's Everyman. In any case, it's all downhill from there. When Bellette finally shares her wartime experiences, so artfully withheld the first time we met her, they turn out to be awful but generic--not a word I would ever apply to most of Roth's output. And the dreadful dialogues between Zuckerman and his dream girl go on and on. "Your breasts impress me," he tells her, pretty late in the game, before slipping in an apposite quote from Keats' last letter: "I have an habitual feeling of my real life having past, and that I am leading a posthumous existence." 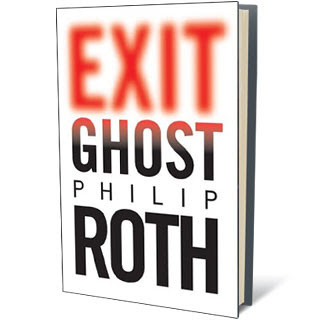 A posthumous existence is a great subject, but Roth has simply failed to nail it in Exit Ghost. After a weird, promising digression on the late George Plimpton--whose mocking exploitation of his own WASP persona makes him a distant cousin of the ever-compartmentalized Zuckerman--the book just peters out. The hero either dies or dissipates into nothingness, as the coiled interiority of the novel collapses in on itself. Who would have thought that Zuckerman's exit would be a matter of such indifference? There may be some truth to his earlier suggestion that "the most potent discoveries are reserved for last." But not this time around. And it seems like only yesterday that Terry Teachout wrote, "No less deeply rooted in the national religious past, one might add, is our distrust of art for art's sake. Over much of the country's history, many artists, like most of their countrymen, have favored an art that exists not autonomously but in the service of some cause whose goodness or functionality justifies its existence." Many thanks, Steve. Roth is a master--even if he did dun Claire Bloom for half the value of every meal they ate together--but the book is still a mess. I think you're right in suggesting that Hitchens clobbered the author for his anti-Bush sentiments. The extra irony is that Zuckerman is too tired, and too detached from the mosh pit of contemporary politics, to join the Bush-bashing party in "Exit Ghost." He shrugs. This, too, shall pass. I believe that Roth, who's publicly stated that George W. Bush is incapable of running even a hardware store--is less indifferent.